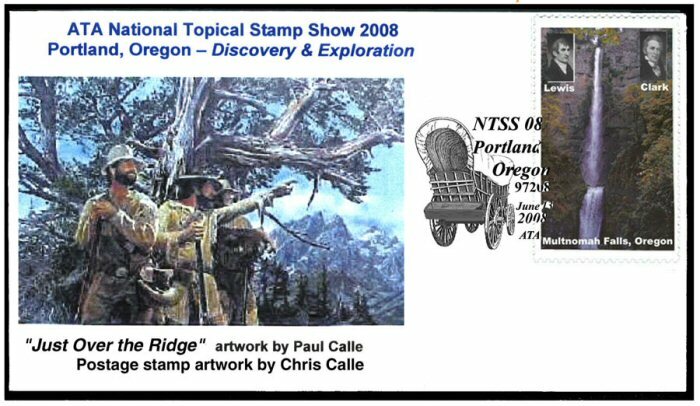 The ATA will hold its annual National Topical Stamp Show 2008 in the Portland, Oregon adjoining suburb of Clackamas on June 13-15.. The Monarch Hotel will be the site of this year’s show and offers free shuttle transportation for hotel guests from the nearby Portland Airport. For shoppers a shopping mall is within walking distance of the hotel. The hotel has also offered to provide transportation back and forth to church services for those wishing to do so. Make reservations directly with the hotel at 800-492-8700, and when checking in, reference the show. ATA President, Bob Mather, has lined up two great scenic tours for those who want to see many of the visual highlights of the Portland area. There will be limited seating so those planning to take either the Thursday or Monday tours should contact Mr. Mather at 262-968-2392, or email him at burrobob@wi.rr.com. Forms for these and the ATA banquets are in Topical Time and also on line at www.americantopicalassn.org. Once again, the ATA will issue tenure ribbons available for all attendees who have been members of the Association for ten or more years. Attendees who may want to assist as volunteers should contact Jack Denys at denys@verizon.net or write to him at 3 E. Cadillac Drive, Somerville, NJ 08876. The hours of the show will start with the 9:15 AM Friday unveiling and First Day Ceremony of a sheet of four stamps in keeping with the show’s theme of Discovery and Exploration. The stamps from a to-be-announced foreign country, were painted by prolific stamp artist, Chris Calle, and will honor Oregon explorers Sir Francis Drake, the first European to see the Oregon coast; Joel Palmer who located the Oregon passage; Capt. Robert Gray who discovered, named and entered the Columbia River; and Lewis and Clark whose discoveries opened the door to the Great American Northwest. A Saturday door prize will be the book, Columbia’s River: The Voyages of Robert Gray 1787-1793. At the ceremony, an Oregon historian will provide some colorful input on the history of the area. The show doors will be open on Friday from 10:00 AM to 6:00 PM, followed by the President’s Reception at 7:00 PM. That event offers attendees a chance to meet and greet other ATA members and officers in a casual setting. It will also be an opportunity to meet the five new Directors of the ATA who will be installed at the show. Saturday’s hours will be the same and will be followed by the annual awards banquet, including having the 2007 Distinguished Topical Philatelist sign the scroll of honor. On Sunday the show will also open at 10:00 AM and will close at 4:00 PM. On Saturday, Nancy Clark, who runs an internet radio show at www.wsradio.com, will present her fascinating program on Lewis and Clark, “Ultimate Road Trip”, a presentation bringing alive the explorations of Lewis and Clark and their faithful cadre with philatelic images. This has been previously shown in teacher workshops in Pennsylvania, Virginia and Washington DC. She will also show a handbook of resources intended for use in classrooms. The presentation is based on a teacher seminar on using stamps in the classroom, with materials developed to teach about the westward expansion enabled by Lewis and Clark. Hers will be one of many free and open-to-the-public seminars and meetings that will be scheduled throughout the show. A meeting of Graphic Artists is being arranged at press time. Dalene Thomas is handling the scheduling of the meetings as well as the awards. The Grand Award will be in keeping with the theme of the show and will be a numbered and autographed print by noted postage stamp designer, Paul Calle. This beautiful work entitled, “Beyond the Ridge” pictures mountain men searching for a route across the Northwestern United States. The FDC cachet will feature another Paul Calle work, "Just Over the Ridge" and the cover will be even more interesting as it is tying in with the stamps, designed by his son, Chris. The ATA will have three different cacheted envelopes with separate cancellations for each of the three days of the show. Friday’s cancel will be space related with the cachet honoring the 50th anniversary of America’s first launched satellite 50 years ago, in 1958. Explorer 1 opened the windows of discovery and the exploration of space by the USA and its allies. Saturday’s cancel will honor the 100th anniversary of Admiral Richard Peary’s discovery of the North Pole in 1908. The cachet will tie into this theme. Finally on Sunday, the cancel will picture Stanley and Livingston meeting in Africa. The cancel and cachet will actually reflect Dr. Livingston’s exploration of the Zambezi River and its tributaries 1858, on this 150th anniversary year. One stamp picturing the Oregon Trail will be hidden somewhere within the exhibits to encourage attendees to take a little extra time from the show to enjoy the only all-topical stamp exhibition held in the United States annually. Those who find the stamp will list the frame and page number on a form that will be included in the show program. At 2:30 PM on Saturday, a name will be drawn from the box in which those forms have been inserted, and the selectee will win $25 in ATA Boy Bucks to be spent at either the ATA Table or with any dealer at the show, excluding the USPS booth. Attendees are encouraged to look at the exhibits and vote for their favorite exhibit as well. Show Prospectus’ are available from Alan Hanks at alan.hanks@sympatico.ca, from the ATA office at PO Box 57, Arlington, TX 76004, or on the ATA website, mentioned above. Dealers will represent all aspects of philately and US and classic collectors are encouraged to attend. A dollar cover booth and a 10c stamp booth are expected. Also, a silent auction will take place during the show.